Modular development has led to a concept called service-oriented architecture (SOA), but one that is very different from the modules in the structure chart. Instead of being hierarchical like the top-down approach found in structure charts, the SOA approach is to make individual SOA services that are unassociated or only loosely coupled to one another. Each service executes one action. One service may return the number of days in this month; another may tell us if this is a leap year; a third service may reserve five nights in a hotel room from the end of February to the beginning of March. Although the third service needs to know the values obtained from the first and second services, they are independent of one another. Each service can be used in other applications within the organization or even in other organizations. We can say that service-oriented architecture is simply a group of services that can be called upon to provide specific functions. Rather than including calls to other services, a service can use certain defined protocols so that it can communicate with other services. 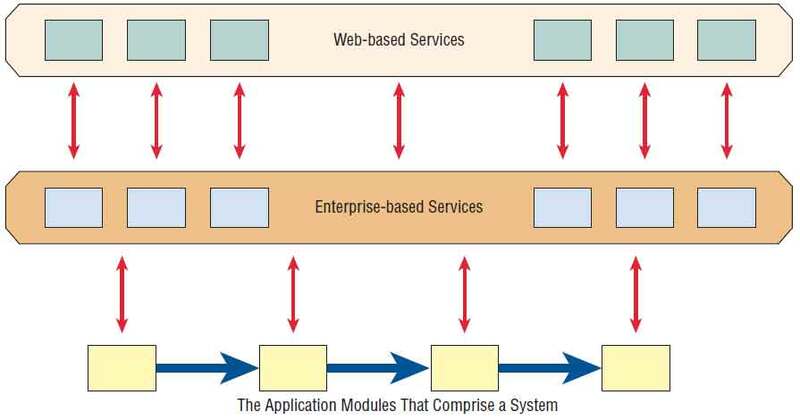 Figure illustrated below shows how services are called upon throughout the system. Services can be general in nature and can be outsourced or even be available on the Web. Other services are more specialized and oriented toward the business itself. These enterprise-based services provide business rules and can also differentiate one business from another. Services can be called upon at a time and can be called on repeatedly in many application modules. 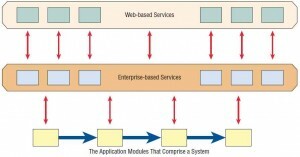 Modules in service-oriented architectures are independent and can be ubiquitous. The burden of connecting services in a useful fashion, a process called orchestration, is placed upon the systems designer. This can even be accomplished by selecting services from a menu of services and monitoring them by setting up an SOA dashboard. While the advantages of reusability and interoperability are obvious, SOA is not without its challenges. First industry standards must be agreed upon. Next, a library must be maintained so that developers can find the services they need. Finally, security and privacy can be issues when using software developed by someone else. Advocates of SOA claim that service-oriented architecture has made many of the features found in Web 2.0 possible.